Towards the end of the Pratunam Market area is Baiyoke Tower, the tallest building in Bangkok and a major tourist attraction. Eat in one of the restaurants at the top of the tower to have an unbeatable view of the whole of the city, especially at night when the lights of the city twinkle below. Pantip Plaza a short walk away is Bangkok's electronics super mall for all types of gadgets and gizmos. Everything from computers to cameras to video recorders and all the accessories you can imagine are available from the many shops inside this indoor shopping mall. For a quite garden experience in the middle of the city visit the Suan Pakkad Palace which is a museum and garden. The building itself is of traditional Thai style, with wooden architecture, but set most amazingly in a beautiful water garden with pools, lawns, shrubs and flowers. Just don't look up and see the modern city bridges and buildings above the woods! While those interest in the mystery of the disappearance of American businessman Jim Thompson may find visiting the Jim Thompson House Museum for clues a good occasion! A beautiful traditional Thai house, but with modern conveniences, it is now a museum and shop. 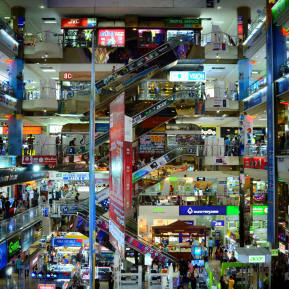 For more shopping, and in Bangkok you are never far away from shopping, a visit to Siam Square is essential. Although now not the most modern mall it does have an amazing mix of shopping, dining and entertaining that makes it still a must-see item on any trip to Bangkok. To experience how integrated spiritual worship is to Thai life you just have to walk along the road and beside Erawan Shrine where frequent performances are made by dancing troupes to entertain visitors. Don't forget the other Bangkok Attractions which may be a little more distant but are still worth visiting! Bobae Market which is a sister to Pratunam! While Pratunam is the premier wholesale garment market in Bangkok Bobae has many interesting things as well. Similar discount garment shops, but much more outdoor stalls are to be found at Bo Bae. Located on Krung Kasem Road look for the Bridges. Bobae Tower building is where more shops are located, here small quantities are welcomed but much of the business is for Russian buyers. Both Market and the Tower open early in the morning, by 6am, but also closed by 6pm. There is no night market at Bo Bae Market. © Copyright 2013, Pratunam Market Bangkok, All Rights Reserved.